Cheick Kongo added to his impressive 6 fight winning streak by knocking out Timothy Johnson at Bellator 208. Kongo finished Johnson in just 68 seconds of the first round by knocking him out by devastating ground and pound. Bellator MMA continues it's 2 event weekend as it hosted another mega event Bellator 208 headlined by Chael Sonnen vs Fedor Emelianenko. MMA veterans and former UFC heavyweights Cheick Kongo and Timothy Johnson faced each other on the main card. A true MMA veteran with more than 15 years and 40 pro fights under his belt, Cheick Kongo headed into the Bellator cage with a pro record of 28-10-2 and an impressive 6 fight win streak. The fight was Timothy Johnson's first bout under the Bellator promotion after made the jump to Bellator from the MMA leader, the UFC. Cheick Kongo delivered his second first-round KO in a row as he finished Timothy Johnson in just 68 seconds of the fight. The two heavyweight giants met in the Bellator cage as Timothy Johnson looked to press for advantage. Just about around the one minute mark, Timothy Johnson attempted a single leg takedown on Kongo after being cracked by a right hand in the previous exchange. Kongo was quick to defend the shot and instead put Johnson on his back. Kongo quickly established control with a knee to the belly and unloaded on Johnson with a barrage of heavy-handed bombs. 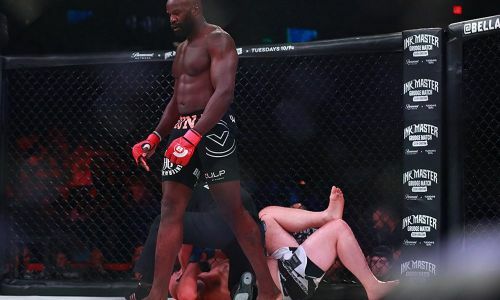 With Johnson visibly unable to defend himself, referee Todd Anderson stopped the contest at 68 seconds of the first round to give Cheick Kongo the victory. After this dominant victory, Cheick Kongo is now on a 7 fight win streak inside the Bellator cage. Kongo also improved on his record of the most heavyweight wins in Bellator and boasts 11 victories in the division now. A rematch with Roy Nelson might be next for Kongo as was mentioned by the promotion's president Scott Coker, a fight that he is eyeing as an alternate if any fight in the heavyweight grand-prix falls apart.